The differences matter: Determining the differences between these fibers can influence how a museum repairs or stores a valuable tapestry. To the untrained eye, strands of unprocessed wool, silk and linen look very much alike. But an analysis of their chemical components shows big differences among them. Recognizing the distinctions is crucial to determining how a rare tapestry or antique rug might be displayed, stored or repaired. This year, Pierce, a senior, is immersing himself in such matters as he takes part in an independent study with Lisha Deming Glinsman ’82, a prominent conservation scientist at the National Gallery of Art in Washington. Glinsman, like Pierce, was a Saint Rose chemistry major. And like him, she was inspired by professors who showed her how to use science to solve mysteries. Vincen Pierce ’16 often loses track of time when he is analyzing materials under the guidance of Lisha Deming Glinsman ’82, a prominent conservation scientist. Glinsman graduated with a strong interest in color theory and, five years later, landed the job at the National Gallery. Working with curators and conservators, she identifies the materials and techniques behind the institution’s paintings, bronzes, photographs and tapestries. In addition, museums around the world invite her to analyze work, which she does with an X-ray fluorescence spectrometer. Her findings reveal secrets about the world’s great art. Now, she has made time to help another Saint Rose student expand his understanding of chemistry. “When I was at Saint Rose, my professor, Sister Mary Rehfuss, helped me get an internship at RPI with Professor Fred W. Billmeyer, the lead color chemist in the country at that time,” said Glinsman, who earned her doctorate from the University of Amsterdam. “That internship confirmed for me that I wanted to pursue a career looking at art,” she added. “And I believe it was an important factor with me getting the job here. I decided to ‘pay it forward,’ hoping this will help Vincen in his career. At work, at the National Gallery. Glinsman shows Pierce museum work behind the scenes. Last summer Glinsman hosted Pierce at the National Gallery. They toured the labs where art is analyzed. In addition to observing Glinsman, the student met with an organic chemist and a conservation scientist who specializes in fibers. He got a tutorial on the instruments they use. Until then, Pierce said he had never considered that chemistry, which he has been a big fan of since days at Taconic Hills High School in Columbia County, could be applied to art. Pierce came back with 15 samples of wool, linen and silk in pinky-sized test tubes. His assignment: identify the chemistry of each. Here is how an infrared spectrometer reads a strand of wool. To do so, he places the fiber in an infrared spectrometer, an instrument resembling a record player that presses the material onto a crystal that analyzes it. 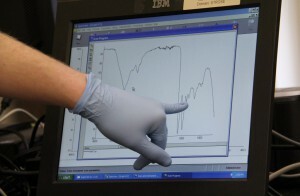 A laptop computer displays the data on a graph showing peaks and valleys reflecting the levels of various components.Vincen Pierce reviews the infrared spectrometer analysis of a strand of fiber. Next, Glinsman sent him six samples that were not labeled. His job was to identify which fibers were which. 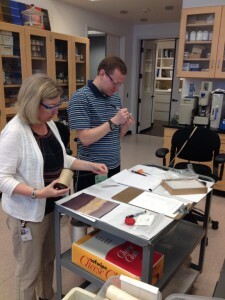 This exercise, Pierce noted, is typical of what an art conservator does. In the spring semester he expects another package from Glinsman, containing samples of fibers that have been dyed various colors. For this challenge, he will need to determine the makeup of the dye along with the material itself. Pierce is keeping a journal of the research and writing papers. 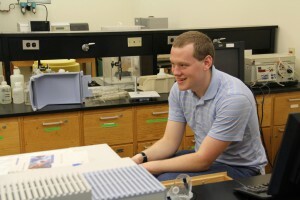 He also will prepare a poster to present at the College’s undergraduate research symposium in the spring. He is applying to graduate school in analytical and physical chemistry. He says the hours in the lab fly by. Assistant Professor Sara Alvaro, who selected Pierce to take part in the independent study and meets with him weekly, has seen him mature and gain confidence.